Another of those random posts. To anyone who is not family of Lillian Coley or Howard Bair, this would be something worth throwing in the garbage. But to the Coley and Bair families, it adds an interesting twist to the life of these individuals. A sort of voice from the dust. 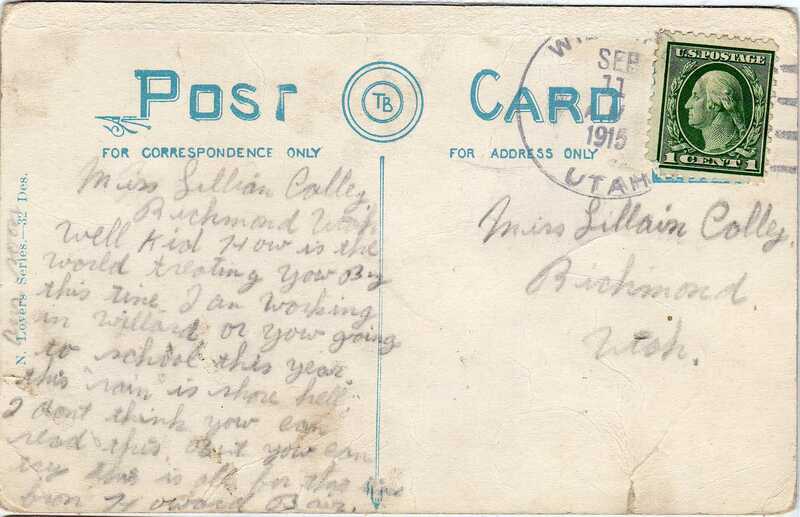 I have written of Lillian Coley elsewhere and of her life. Howard Francis Bair was born 25 June 1898 in Richmond, Cache, Utah and died 9 March 1974 in San Diego, San Diego, California. They were probably the same year in school growing up. On the side above the pre-printed “N. Lovers Series” Howard writes “am soon” It may just be coincidence it is written above the writing, but I have no idea what it would mean otherwise, but who really knows what this meant 100 years ago.